I have extreme respect for marathon runners. Actually, have mad respect for anyone who can run for more than four minutes at one time without stopping. I’m a sprinter, which pretty much describes my personality … plus, it makes it shopping easier during mad end-of-season sales. Susie Hewer, who is absolutely neanimorphic (there is NO WAY this woman is over 50), is a marathoner. 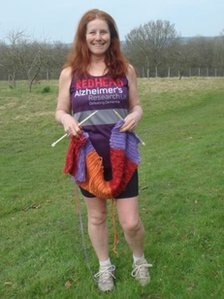 Not only does Susie run marathons, but she KNITS WHILE SHE IS RUNNING MARATHONS. I’ll pause for a moment and let that sink in. What she does is run marathons to raise money for Alzheimer’s research. She is personally affected by the disease and runs in the UK to help combat it. Not only is that an admirable cause, but HOLY CATS IS THAT EXTREME KNITTING OR WHAT? I’m having a hard time wrapping my head around that, but in April’s marathon Susie knitted up a scarf of NEARLY EIGHT FEET IN LENGTH. I’m completely gobsmacked, really. 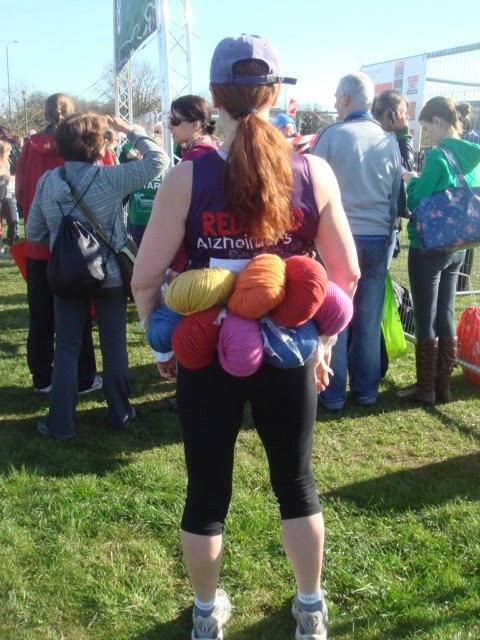 So go check out Susie’s blog, Extreme Knitting Redhead, and read her story – and get inspired. 101-yo Knitter Has Been Knitting for 92 Years! “Knit Sip Knit” – Perfect!